In the WordPress space, there are a couple of contenders for general SEO plugin, but Yoast is the most consistently easy to understand and implement. Yoast SEO deals with on-page SEO. If you want your site to rank in Google then you should really be taking a keen interest in the fundamentals of SEO. One of the best returns on investment in marketing is content marketing. Use tools like Yoast to help your content rank higher and attract more visitors to your website. Note: Yoast is not a replacement for an SEO strategy. Yoast will not help with keyword research, backlinks, or any other form of Search Engine Optimization. The plugin will provide you with templates for correct keyword placement and title formatting. It also helps with sitemap creation and maximising your website's visibility in the search engines. If you haven't done your research then Yoast will not make things better. 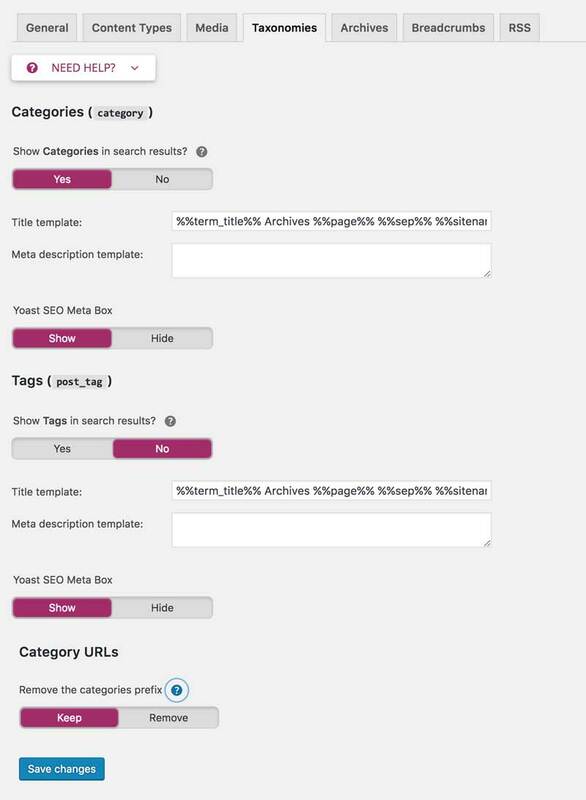 Learn to configure the Yoast SEO plugin correctly. To get more than 20% of the software's benefits, correct setup and configuration is vital. The default installation is not optimized for every website. Reaching page two in a novel means you’ve achieved something. Reaching page two on Google means you have a lot of work to do. But if you apply the intelligent strategies in this post to your SEO keywords strategies then there’s no reason you won’t move up a place or two and make it to the front page. According to searchenginewatch.com and Protofuse.com 33% of clicks go to the first result on page one. A rather shocking 10% continue to the second page of results. That speaks for itself. Chitika’s study from 2013 shows that even the first result on page two only gets 1% of traffic. It should be clear that SEO is important for content marketing. If your site is not optimised then your content has the immediate disadvantage of being harder to find by people using search engines (almost every web user). Before attempting to improve SEO it's a good idea to look at your content and determine which keywords you would like to rank on Google for. If you run a Mountain Guiding site then the words Mountain Guiding, Mountain Guide, and Guiding Services are very important but we can use tools to find out a bit more about our potential customers. Once you have your keywords you can then implement an SEO strategy. 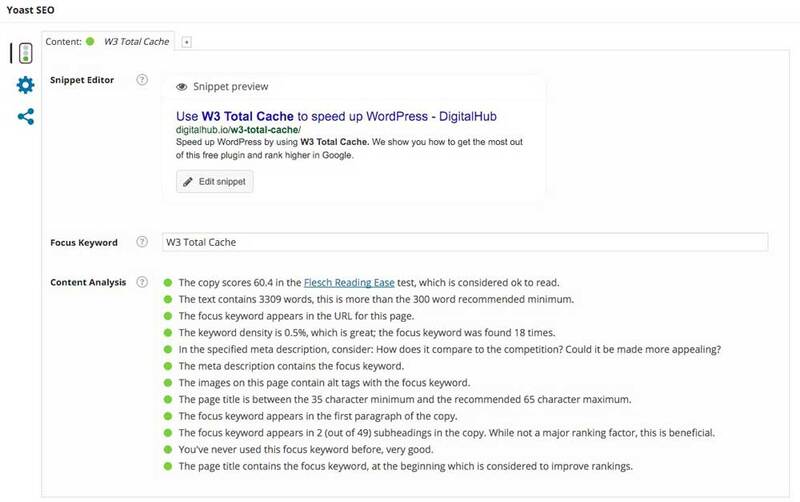 Installing the Yoast SEO plugin on your WordPress site gives you a lot of power to improve SEO with guided recommendations. In this article, I’ll go into depth on setting up Yoast for maximum impact but you can skip to here (once the plugin is installed) to read about individual page SEO and keyword placement. First things first, let’s install Yoast. The procedure for installing the Yoast SEO plugin is the same as for any other WordPress plugin. Click ‘Install Now’ inside the Yoast SEO box. Click ‘Activate Plugin’ and a new option called SEO will appear on the admin bar. Once the installation steps are completed we can then take a look at Yoast’s configuration steps. Otherwise, read on for a thorough explanation of Yoast’s capabilities and configuration options. Click on the SEO icon in the WordPress admin to go to the Yoast Admin area. The Dashboard section is where you can kick off the configuration wizard. Useful if you need to get started right away. I prefer to use a manual approach and run the entire process. The Dashboard also highlights tasks to do and updates to the software. Under the features tab, you'll find most of Yoast's good stuff. This should be left on. The whole point of the plugin is to help with SEO. But this ‘feature' is probably the one that has most people convinced that Yoast helps with SEO (in the background or as some sort of algorithm). As I mentioned, Yoast is a guide and has some neat features for optimizing your site. Yoast can't save a poor SEO strategy. In the old days of the Internet, it was easy to use keyword stuffing and garbage content to rank websites. These sites were unreadable but they worked. Thankfully, that's not the case anymore. The word on the SEO street is that readability is crucial to your content marketing strategy. Make sure your visitors can easily digest information and have their questions answered. This is where the readability analysis comes in. Yoast lets you know when your content is hard to read. You'll want to leave this option on. The readability analysis is basic and doesn't compare to ProWritingAid‘s results, for example. It's free, though. This is a new feature in the latest Yoast update (March 2018) and it helps sculpt better internal and external link profiles. Linking to important pages on your website (internal linking) can help boost the rankings of these pages. Linking indiscriminately will probably do more harm than good. Linking out to hundreds of domains from one post could send spam signals to Google so it's worth keeping an eye on the link volumes. This counter is a handy reference and if enabled, shows you how much your page or post is using links. If you're used to the old Yoast then the XML Sitemaps feature might appear to be limited. The functionality is still there but the Yoast team has hidden (cleaned up) the admin options a bit. Click the question mark icon beside XML Sitemaps to a link to the live sitemap and an article explaining why sitemaps are important. Ryte used to be called Onpage.org and is a very powerful monitoring and optimization tool for websites. Yoast integrates with a free Ryte tool that notifies you if your site has issues with indexing by Google. Leave this on unless it gets in youur way. On multi-user/multi-author websites you probably don't want every user to have the ability to change SEO settings. I the wrong hands these settings could have disastrous consequences. make sure this feature is enabled so that only administrators can make changes to the Yoast settings. This is where you can quickly add the Google, Bing, and Yandex meta tags to your site for their webmaster tools verifications. Google is the main one here but I'd recommend Bing too. 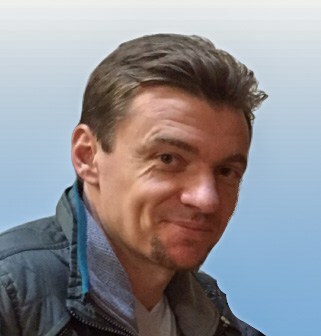 Adding your site to the Yandex search engine can be useful if you have an international audience. 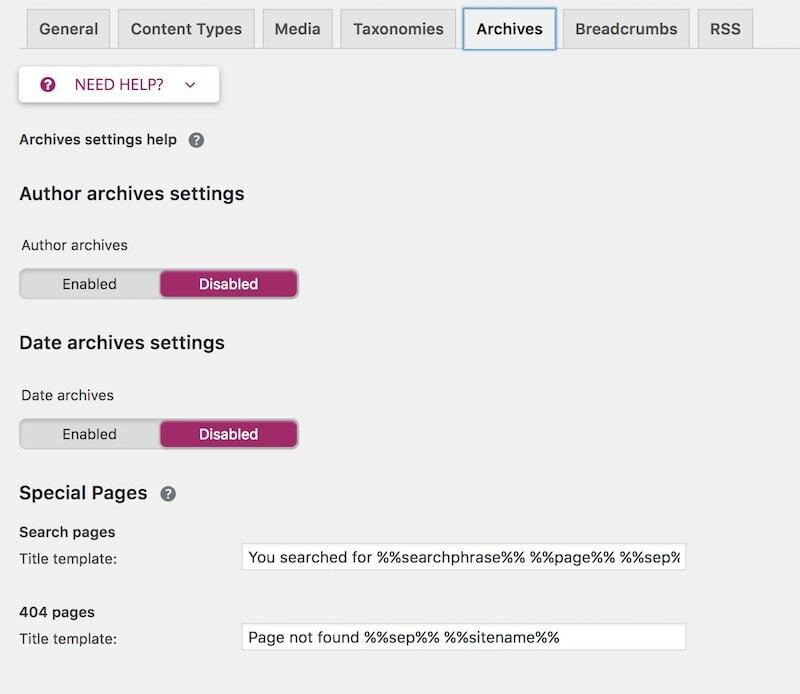 The Search Appearance section gives you the ability to change how the titles of your pages and posts are displayed, as well as the meta descriptions within them. You can do this through templates which are configured for individual elements of your site in the following tabs. The title separator is simply a symbol that separates the displayed name of the site and the post/page title. 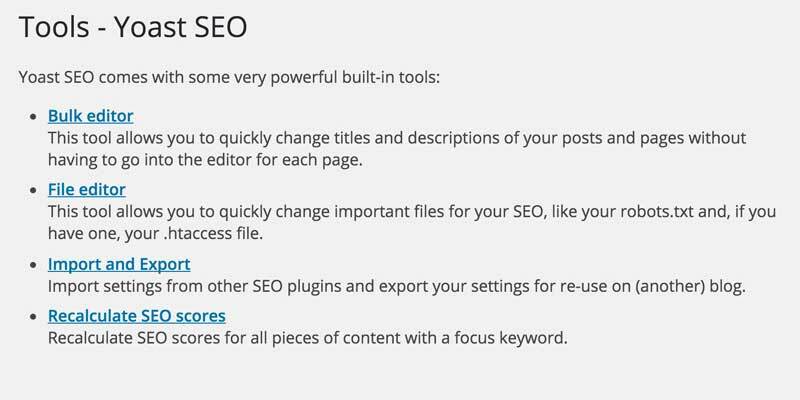 Example: “The Best Seo Plugin For WordPress 2018 – Fat Frog Media” or “The Best Seo Plugin For WordPress 2018 | Fat Frog Media”. You can also remove the title separator and the name of the site from the SERP listing. If your WordPress theme's front page is widget-based then you edit the appearance of the homepage and title using the Settings > Customize menu or via the link on this page. Add the Google knowledge base data for your website as either a business or a personal website. Post Types are how WordPress refers to different content templates. In this section we can edit how the titles of posts, pages and media such as images, are displayed. You can create your own meta description templates here although it’s good practice to create a meta description on every post for maximum SEO impact. Meta descriptions are used to give the user an idea of what the page is about and can be used in search results. Toggle on or off the Date in Snippet Preview option if you prefer the date not to appear beside your content in the search results. Many search engine marketers prefer to turn this off as they believe people will not click on links that are more than a few months old. This depends on the topic but if you write about timely or trending topics it could work in your favor to leave it on. If you write infrequently and use evergreen content then turning the Date in Snippet Preview off could work better. it's worth testing to find the right option for your content. Keep the Yoast SEO Meta Box toggled on unless you have a multi-author website and prefer other authors not to alter the post SEO settings. Pages refer to your sites pages such as Contact, About Us. The procedure for creating titles and Meta description templates is the same for the Posts. Depending on your theme you might also have Products, Custom Post Types, and other types of templates. Media refers to images, audio, and other types of multimedia that you might have on your site. Go with Yoast's recommendations on this one. Here’s where you'll most likely need to change a few settings in order to have a well-optimized SEO setup. Categories are lists of posts. In a way, they work similarly to tags, those words you often see in the tag cloud on a website. The fact that categories pages are essentially blank containers for other pages means that they do not always need to be indexed. In fact, if Google indexes the page it can have a negative effect on ranking. Only allow Categories to appear in search results if you have a very well designed category structure. It would also help to have content on the actual category pages. The Show Categories in Search Results and Show Tags in Serch Results are easier terms to understand than in previous versions of Yoast. Turning these settings on and off was done by selecting the Index or No Index option for Meta Robots. This is the technical way of looking at it but for many WordPress users, the terms were confusing. We recommend setting the Categories toggle to Yes and switching off the tags toggle. Tags can often be indexed before your content. They can even rank higher than the posts with the same keyword. This is merely diluting your website's SEO value. Remove the tags and focus your keyword efforts on individual pages or posts. If you have products and other types of ‘posts' ob your website they will appear in this section too. Product Tags and Categories should be treated the same as posts and page categories and tags. This experiment by the searchenginejournal.com shows that Noindexing taxonomies can have a positive effect on organic traffic. There is some debate over whether to Noindex archives but if you are running a single-author blog then you should have ‘Author Archives’ disabled. Date archives won't help the SEO of your site so you can safely leave this set to the default of ‘disabled'. 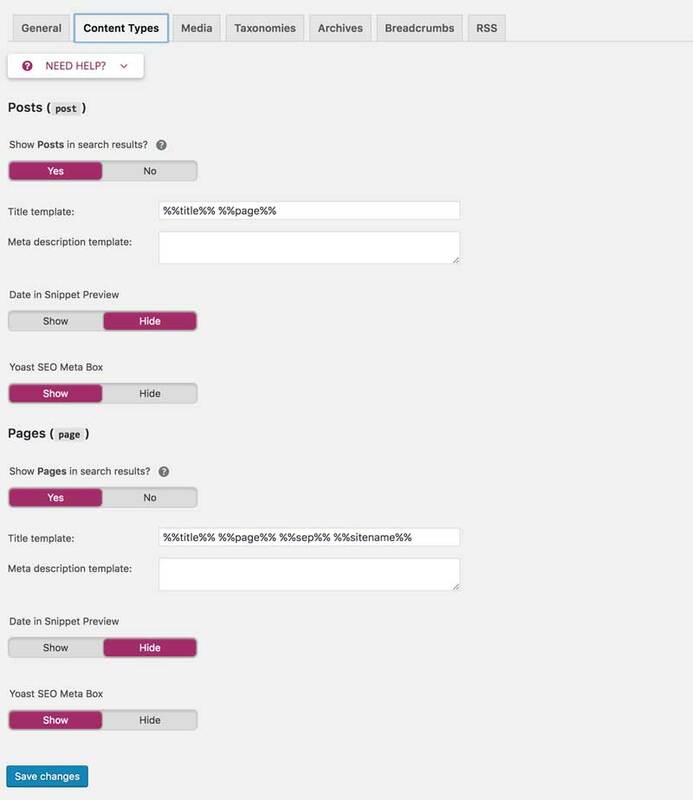 The special pages section is a new feature in Yoast and gives you the ability to change the Title templates of both the website internal search pages and the 404 (page not found) pages. 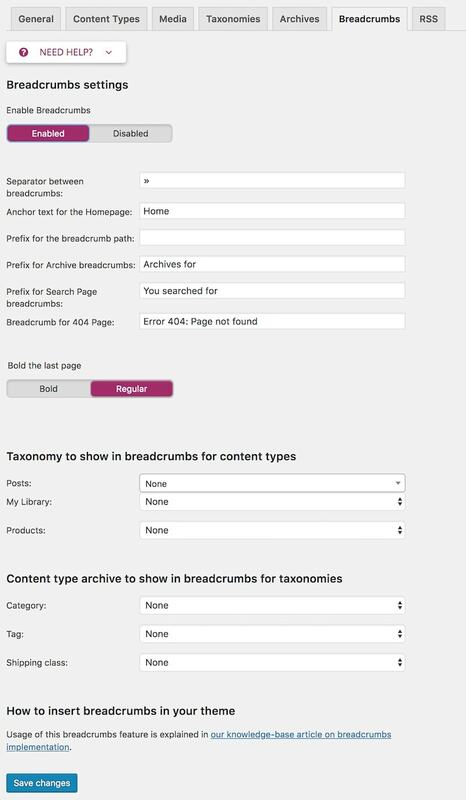 Read Yoast's take on why breadcrumbs are important for SEO. We'd recommend using breadcrumbs for websites with lots of pages. Check your theme’s documentation to see if you can use breadcrumbs without problems. The theme may already provide this feature but if not then you can use Yoast’s option. Bolding the last page in the breadcrumb is a matter of preference, but it can draw the user's eye. Meta descriptions in Google's search that contain the keyword are bolded automatically and this appears to generate more clicks. The same could work for breadcrumbs. Now the technical part. To implement breadcrumbs on your site you will either need to edit the PHP code in your theme or install a plugin. Another new feature in this new Yoast 4.4 version (late February 2018) is the RSS feed SEO options.This feature is a more advanced than anything we've discussed so far. Unless you're familiar with how search engines and web scrapers work, leave the configuration at the default settings. Whatever you do, make sure to leave the %%POSTLINK%% and %%BLOGLINK%% variables so that search engines can identify your blog and posts as the original source of the content. If you'd like to view Google Search Console data directly inside of the Yoast admin on your website, follow the simple instructions on this page.If you’re signed into your Google account (the one that controls your Google Search Console access) you will be redirected a page containing a code. Copy the code, paste it into the code box beside the button Authenticate and then click the button. Then select your profile (in the event that you have more than one site) and click Save Profile. Before starting, you should have a Google Search Console account set up for your website. Once you've connected Yoast to the search console a new set of tabs will appear. Desktop, Smartphone, and Feature Phone. Each tab offers a different look at the URLs on your website and how Google sees them. Last crawled date, first detected date, and response codes show how healthy your site is and how easily Google can read it. This is a great way to troubleshoot your site too. The response codes for each URL should be 200, indicating that everything is OK. Check the 404 errors to see if you've got problems or missing pages. Not all 404 errors will impact the site negatively, however. 404 errors refer to pages that no longer exist or have been renamed. Google’s crawler has found links and references to these pages and can’t find them. This hurts the SEO score so it’s always worth checking these errors regularly and fixing them. Only redirect pages that once existed. If there are any 404 errors for random pages there’s no reason to redirect them. Leave them as 404 pages. Facebook, Twitter, Instagram, Linkedin, Myspace, Pinterest, YouTube, and Google+. This isn’t an essential part of your SEO strategy but it’s worth spending a few minutes to fill out the details here. 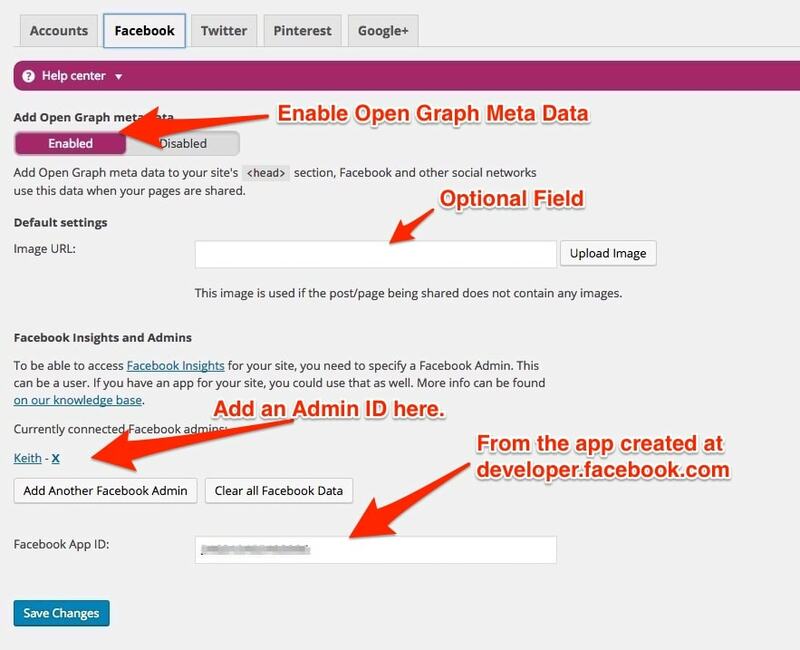 Adding the Open Graph settings to Facebook and Pinterest will make it easier to share content on those sites. Facebook will be able to pick up the right thumbnail and information when you share your page. The Accounts page is straightforward, just enter the usernames or URLs of your accounts. On the Facebook tab, set the ‘Add Open Graph metadata’ to Enabled (if you have a Facebook account, of course). Enabling Facebook Insights is not part of the scope of this article but I will explain how to set this up in a future article. This advanced part of yoast is worth exploring as using the tools can save you lots of time. Back up your Yoast settings and import Yoast settings from another blog using the Import and Export feature. Very useful once you have finalised all settings and want to move them to other sites. Edit the robots.txt file and the .htaccess file directly from the browser in the File Editor tool. A great time-saving tool. FTP or SSH access is usually required to perform these tasks so you won't need to fire up any 3rd party software to get editing. The .htaccess file is a set of directives to the web server that should not be altered by anyone unfamiliar with web server configuration methods. Yoast will change the settings automatically as you configure it but if you’re proficient in editing this file you can do so here. The robots.txt file is used to block web crawlers from reaching certain directories on your website. We don’t recommend bulk editing titles and descriptions but you can do so with the Bulk Editor tool if you wish. You may see the message ‘recalculate SEO scores’ appear in the Yoast dashboard from time to time. You can perform the recalculation at any time from this section. The Yoast team provide little information on this option and by all accounts, it appears to be more of a nice-to-have rather than an important option. 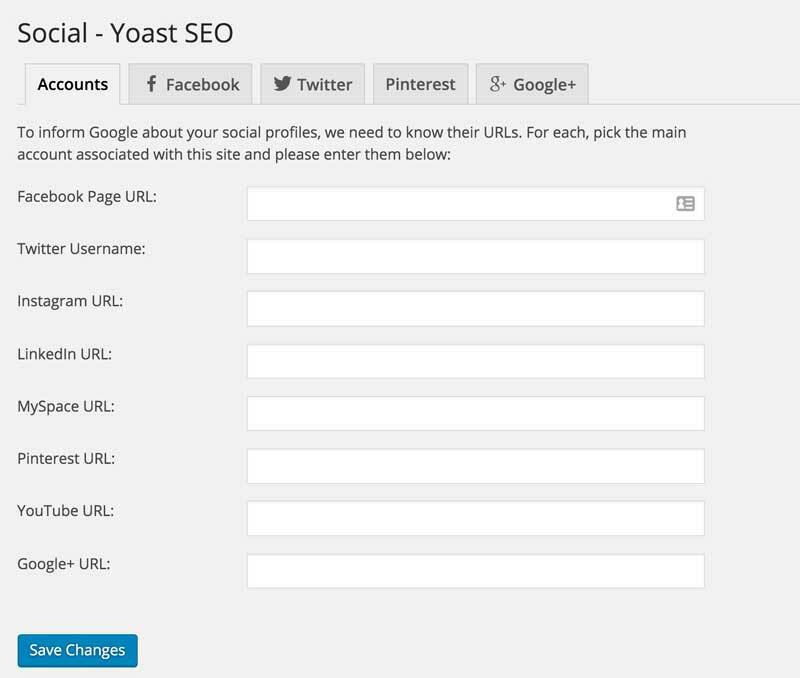 Now that’s we’ve configured Yoast properly we can focus on the SEO settings of individual posts. This is referred to on-page SEO. The image above shows the Yoast SEO page for an example post that gets the ‘green light' for the post content. Don't worry too much about getting all green. In many cases, it’s hard to get 100% green lights without making keywords appear forced. This is especially true if your focus keyword is a phrase of more than one word. Put the Keyword in the title, H1 tag, the URL, a sub-heading, and the first paragraph. That’s a lot of places to put the phrase ‘W3 Total Cache’, for example, but with some imagination, it can be done. The focus keyword is just one part of the SEO structure for a post. Let’s take a look at how we can improve all aspects of SEO for a post. If you’ve just installed the Yoast SEO plugin or you've just started a post you won’t see anything in the Focus Keyword box. The Focus Keyword should contain a word or phrase that mirrors the title of the post. If the post is called ’Top 10 SEO tips’ then the focus keyword ‘SEO' would work, but so would ’SEO tips’ or even ‘Top 10 SEO tips’. Longer focus keywords will make the post more SEO-unique but will also make it harder to use the keywords in all the right places. A keyword of ‘SEO' alone will be easier to insert into the title, H1 tag, URL, etc. 2-5 words will do. In our example case, ‘Mountain Guiding trips in New Zealand' is better than ‘Mountain Guiding' if we want to get clients that are looking for guiding trips in the New Zealand Alps. The snippet preview is simply a preview of how your post will appear in Google’s search results. You can edit it directly by clicking ‘Edit snippet’. Below the snippet editor you will find the Focus Keyword and below this, you will find the Content Analysis. The Content Analysis section displays results of Yoast’s check on your content for SEO-friendliness. If the focus keyword is not ideal or the l the content is not of the suggested length a notification will be displayed here. The meta description should be 130-155 characters. Anything over that length risks being truncated in the SERP. Try using ‘Find out how!’, ‘Check out how I did it!’, or ‘Try for free’ will invite people to click. Make the description unique within your site and it should contain the focus keyword. The Yoast team describes the meta description’s purpose as ‘a way to get people searching in Google to click your link’. In the past meta descriptions were used for keyword stuffing. Google then changed the search algorithm to completely devalue the significance of the meta keywords. What this means is that the meta description doesn’t affect SEO that much (directly) but it’s very important as it’s the first thing that someone sees when looking at your search result in Google. Make sure the Meta Description is relevant and contains a compelling headline to grab attention. To start with, don't spend a lot of energy trying to get green lights on all posts. This can work against you. Manipulating the post title, keywords, and content purely to get a green light on all indicators to the detriment of your post’s intended purpose and value is a trap you should try to avoid falling into. Make sure the post’s keywords and content actually display what your post is about. The focus keyword is what you want to rank for on search engines so it should be the main thread of the post. Think of it like this, the most important thing is the content, then the SEO should be built around that. Don’t get those steps reversed. The focus keyword should also appear in the URL of the page. As you can see from the snippet screenshot the URL of the page is https://fatfrogmedia.com/w3-total-cache and the Focus keyword is w3 Total Cache. Headings are important as they give structure to your page and they also help search engines understand the content. It goes without saying then that the headings should relate to the content. People also love jumping to the relevant (for them) parts of your article, and creating headings helps them find what they came for. Without headings, a page of content looks like a lot of hard work for the hurried internet consumer. You should only have one H1 on your page. This is taken care of my the title of the post/page. It’s the most important heading. H2s are the next most important and you can have as many of these as you like. H2s should define sections of your post. Use keywords in the H2 headings. Yoast recommends 300 words as the minimum for a blog post. You don’t have to follow this and it’s better to ignore it rather than put filler on your page. However, statistics show that posts of 1000 words or more rank higher in Google. Don’t use the same keyword in more than one post!. One focus keyword per page is the key. If you try to rank multiple pages for the same keyword Google won't know which to put forward in the SERP. The result is lower rankings across the board. I try to get all green lights on the Content Analysis but occasionally I see a red light with the description ‘The focus keyword doesn’t appear in the first paragraph of the copy’. This despite the fact that the keyword is in the first paragraph. This appears to be a bug with Yoast which only recognises the keyword if it’s inside a paragraph tag in the first paragraph. In my experience, any other type of tag (heading, image, etc) will not work. To fix this put some <p> tags around the first paragraph and that little problem should go away. If you look to the left of the Yoast SEO panel you’ll see three icons. One is a traffic light, the other a cogwheel, and the third is a type of network node symbol that represents sharing. Click on the cog icon to enter the Advanced section of the page analysis. We can then customised advanced options for the individual post or page. If you’re new to Yoast then you can ignore this section but know that it can be a very useful section and it’s worth having an understanding of it. The Meta Robots Index option defines whether the post should be indexed or not. The default is Index and this will be the setting most pages will take. Changing this to NoIndex instructs search engines to not show your page in search results. Reasons to Noindex a page might be to hide from search engines a promotion/offer page that’s not password protected but contains ‘exclusive’ information. The Meta Robots Follow instructs search engines to follow or not to follow links on your page. The default is Follow so why would anyone use ‘nofollow’ for a link on their page? To explain this we need a very quick introduction to how Google indexes pages. If someone links to your site then Google will apply a small increment in the SEO value of your site. Google likes links. Pages with lots of links inbound must be authority pages. Google loves authority pages. PageRank is the famous algorithm that calculates all of this. A link with the ‘noFollow’ will not receive this SEO boost. In the past spammers manipulated the ‘Follow’ attribute and PageRank to boost their sites rankings by posting all over the internet and creating fake sites with links back to their site. The NoFollow attribute was created to help combat this. Comments from spammers (or anyone) on your WordPress site are automatically given the noFollow attribute. NoFollow helps to show Google that you either don’t trust or can’t vouch for the link you are providing. Basically, you are disowning any affiliation with or validation of the content on the site you’re linking to. So why use noFollow? Google transfers PageRank from your site to another if you use ‘Follow’ links. SEO experts refer to the value transferred as link-juice. Giving away link-juice is seen as a bad thing but Google doesn’t recommend making all external sites Nofollow. Be aware that using the noFollow attribute on your page makes all links NoFollow, including internal links (back to your own pages). Here’s a video of Matt Cutts from Google explaining NoFollow links. It’s not clear what Google’s stance is. Matt Cutts spends a lot of time in videos talking ‘around' a subject but not fully explaining it. We can take from this that even Google is not 100% sure. Take my advice to be on the safe side. Use ‘nofollow' on paid links, affiliate links, and untrusted content. If you have links that you trust and are relevant you should use ‘follow’ links. There’s some debate over the usage of nofollow links and ranking performance. In the basic sense, the nofollow tag tells a search engine not to count a link as an endorsement or vote in favour of that page. Ultimately it can harm your site if Google believes it to be a link-farms, or involved in some black hat SEO practices. You use the NoFollow directive to show that you have no special relationship with the other site and that you are not trying to influence the ranking of that site. In this way, Google will not think you are trying to build links to another site and cheat the rankings. Backlinks are one of the most important factors in determining a site’s ranking so Google watches out for fake link building. Keep in mind, that these are recommendations and nothing is set in stone. Another issue is with internal links. If you set the page to ‘nofollow' all links then internal links receive the same treatment. Google recommends not to do this. Yoast doesn’t seem to have a good answer to this and don’t provide the option to select ‘nofollow' for external links and follow for internal ones. Meta Robots Advanced is a section most people will never need to touch but here’s a description of each, direct from Google. The Canonical Url is quite an important one but is useful only if you are referring to a piece of content similar to the content on your page, and the referred page is the preferred version. 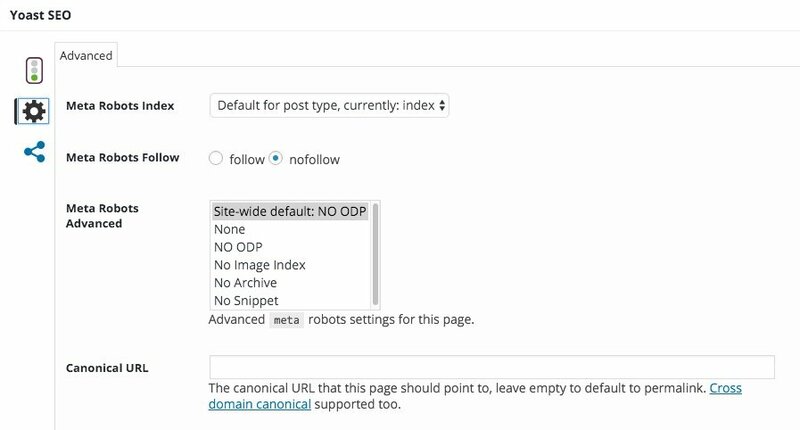 In WordPress, we set the Canonical URL through the WordPress General Settings section. We can then tell Google through Google Search Console which version of our site (the www or non-www version) is the preferred one. 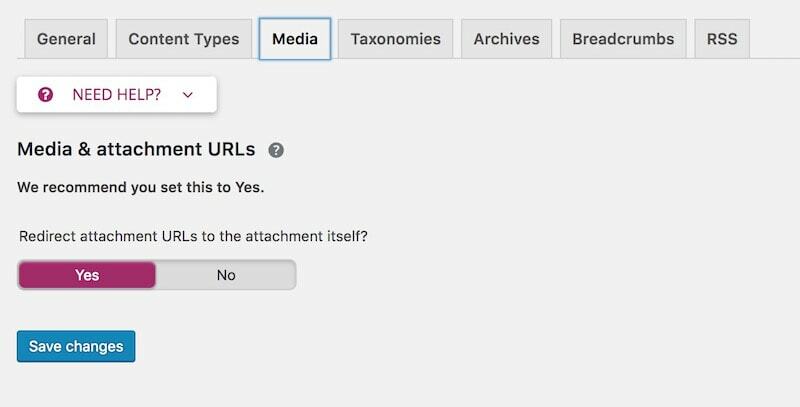 In the case of individual pages, the Canonical URL option can refer search engines to the preferred version of a page to prevent duplicate content being indexed. This is used more on eCommerce sites than blogs, for example. These are all Advanced settings so proceed with caution. For the majority of WordPress users, the advanced section will never be used and the defaults will remain untouched. The Sharing tab is much easier to understand than the Advanced section. In fact, the settings are self-explanatory. This section allows you to customise how your social media shares appear on each social media network. You can change the title, description, and image of the link to your post in this section. The image size recommendations are printed below the Image path box. Armed with the knowledge above you should be able to optimise the Yoast SEO plugin for your WordPress site in less than an hour. Optimising each individual page is something you should do with every new post and consider it part of the website management tasks. Changes to the SEO of your content can have a significant impact on your site’s ranking and usability. SEO can be performed manually if you understand HTML and there are alternatives to Yoast but I’ve found Yoast SEO to be the best plugin for WordPress (in any category). That’s about at clear an explanation as I’ve seen so far.